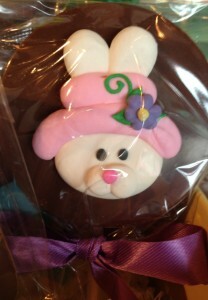 At Bon Bon we’re celebrating this springtime holiday with Easter gift novelties and chocolate galore! 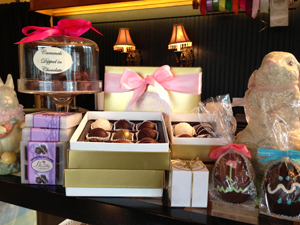 From “Bainbridge Island Fudge” wrapped with a satin bow, to boxed assortments of chocolates or candies in beautiful wrapped packages. Our popular items include jelly beans, cream eggs, chocolate bunnies, and a wide selection of other specialty confections that we can assist you in making the perfect gift or Easter basket.Our goal is your satisfaction. With a friendly greeting and efficient service, we strive to offer only the finest chocolates and confections available.Our shelves are filled with your traditional favorites as well as a wide selection of local sweets, treats and gifts. Come by and enjoy the fun and beauty of our store this Easter. 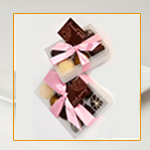 wrap in a hand tied satin ribbon and personalized gift card! Chocolate Bunny Pops! 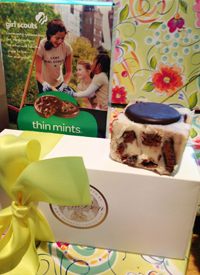 Thin Mint Fudge … Limited Time Only!